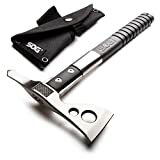 Do you know which are the top 10 best Hunting Camping Axes & Hatchets in 2019? Let us face it- going camping or hunting without an axe will negatively affect the experience. How are you supposed to chop the logs or wood? How will you crush the bones from your catch? Sadly, many people still go camping or hunting without an axe. Some will carry a poorly crafted axe that may be ineffective, cumbersome to carry or isn’t designed for the activities. The wrong product is more likely to cause injury to you and other people. But before we proceed, let’s start by looking at the key features of good Hunting Camping Axes. Head Material: Stainless steel and carbon steel are the common materials of construction. The former material is known for its good looks, resistance to rust, and corrosion. However, it doesn’t maintain the sharp edge for long. The latter, carbon steel, is loved for maintaining the sharp edge for longer and good striking power. Unfortunately, it’s prone to rust and corrosion and requires more thorough cleaning. Handle Material: Wood, plastic, and metal are the popular materials for the handle. Wood looks authentic, feels smooth, but requires more cleaning. Plastic is light, smooth on the hand, and easy to clean. However, it is not very durable. Metal is the most durable and also quite solid. Nevertheless, it increases the weight and may not be as comfortable as wood. The shape of the Head: The head will vary from one axe to another. Some are flat topped, others slightly curved, while there are those that come with a flat backside. A flat top is more all rounded, a straight edge is suitable for splitting wood while a head with a downward curve is designed for splitting hard wood. Length: The longer the axe the more force it exerts. However, it may be a bit cumbersome to carry and will require more effort. A too short an axe, though portable, requires more effort when used on hard wood. Edge Sharpness: Did you know that you can shave your beard with a very sharp edge? The key to improving efficiency and productivity is using an axe with a very sharp edge. It also helps to go for a type that is easy to sharpen and keeps the sharpness for a longer time. Sheath: A good axe comes with a quality sheath for added protection and good storage. It will not only cover the axe but is also easy to use and won’t interfere with the sharp edge. Good sheaths are easy to handle and can be attached to a backpack or the belt for added convenience. In this review, we will look at the top 10 products of Best Hunting Camping Axes & Hatches that are worth your time and money. Just as hinted by its name, the Yes4all axe is suitable for most users and applications. It is useful for camping, hunting, hiking, and many other outdoor activities. The sturdy axe is built from premium 420 stainless steel for reliability and durability. It’s coated with black paint for improved protection against rust, corrosion, stain and the elements. It features a non-slip handle made from strong nylon wrapping and provides a firm grip even when wet. The large 3.7-inch head together with the broad edge delivers the perfect blow while black heavy-duty nylon sheath offers a good storage point and protection. Consumers love its nice size and weight, ergonomic handle, rust/corrosion resistance, solid construction, sharp edge and durability. A few nonetheless claim that the para cord rope handle isn’t very comfortable and may feel a little awkward. 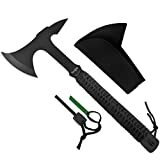 Camping and hunting expedition is more exciting with this axe. It features a 2.75-inch head made from sturdy 420 stainless steel and has been coated with protective hard case black paint. The fairly long axe measures 12.5 inches in length, weighs 19 ounces and has a straight edge head. It is designed for a range of applications including cutting, chopping, hammering, pound, piercing, prying, opening, shaving, and notching. The glass-reinforced nylon ballistic handle is strong and offers a firm grip even in wet situations. For improved storage and protection, this axe includes an easy-use and soft nylon sheath. Its main merits include sturdy construction, durable, practical design, easy to use, and well balanced. The negative is that it feels a little light. Coming in dimensions of 11 x 1.5 x 6 inches and weighing about 1.8 pounds, this black axe by MTech is among the top hunting camping axes in 2019. It comes in a 2-pack and consists of a quality 440 stainless steel head and a durable rubberized handle. The blade is 3 inches long, features a satin finish, and is ideal for camping, hunting, hiking and other rugged outdoor expeditions. The light and compact item can safely be stored and carried inside the black nylon sheath while its moderately light weight makes carrying and handling convenient. In addition to quality construction, compact nature, lightweight, and ergonomic design this axe is also liked for its simplicity and user friendliness. Some consumers, unfortunately, claim that it’s a little small for heavy chopping, pounding, or cutting. Measuring 26 x 7 x 1.4 inches, the Black-Special Edition axe by Estwing is designed for use in the rugged outdoors. Like other best-selling hunting camping axes, it’s also made from sturdy stainless steel that resists rust, corrosion, and stains. The forged steel head can tolerate regular use while the tempered 4-inch cutting edge makes chopping, cutting, and splitting wood easy. The heavy-duty ballistic nylon handle provides a firm grip and absorbs maximum shock and vibration. It also features a sturdy ballistic nylon sheath for improved storage and safety. The head comes with a fairly sharp edge and doesn’t become blunt too easily. Despite its good power delivery and solid nature, the axe is one of the lightest and only weighs 7 ounces. Some of the advantages include hard edge, well-balanced, feels solid, great price, portability, and easy to use. The disadvantage is that the handle isn’t very long. This axe should feature in your hunting and camping accessories. It comes with a forged steel head that delivers hard blows without chipping, warping, cracking or being damaged. This effect is further enhanced by the sharp cutting edge and long glass-filled nylon handle. The axe is 15.6 inches long, weighs 26 ounces, while the head measures 2.7 inches in length. It boasts of a Gator Grip handle that offers a firm and non-slip hold whereas the included saw improves functionality. According to consumers, this axe feels very solid, is well constructed, and swings rather easily. It’s also easy to operate and can penetrate both soft and hard wood. The only negative comment has to be the edge not being ultra sharp. With this survival hatchet by Gerber Bear Grylls, you will find life in the wild more accommodating. Thanks to its decent length ( 13 inches) and weight ( 1 pound), this axe easily chops, splits, cuts, and pounds wood, both wet and dry. It comes with a 3.50-inch head that is made from high carbon steel and retains its sharp edge for longer. And considering that it features a full tang, chances of the head separating from the handle or breaking are very minimal. The handle comes with a soft and ergonomic rubber grip and prevents accidental movement or slippage. The included mildew-resistant nylon sheath improves storage and carrying while the razor sharp edge enhances functionality. Its main positives are an extra sharp edge, sturdy construction, compact, and lightweight. The negative is that it may rust when exposed to water or moisture. Do not be deceived by its small nature and lightweight for this axe packs quite a punch. 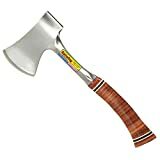 Coming from one of the respected brands in the market, the 2000003368 Coleman axe is suitable for camping, hiking, hunting, and other outdoor activities. It has been on the market for quite a while and still stands out as one of the best. It features a decently sized head made from forged carbon steel. In addition to having a sharp edge, it also maintains the sharpness for a longer time. The camping axe measures 1.5 inches long and consists of a long handle for delivering hard blows while using minimal effort. Furthermore, the ergonomic handle is not only comfortable but also feels smooth on the hand. Like other top axes, it also features a protective and convenient sheath. It scores highly for its light weight of 1.8 pounds, good length, nonslip grip, ergonomic nature, and portable. It, however, isn’t designed for heavy-duty use. Available in gray colour, this wooden carpenter axe by Husqvarna is quite common in the market. It is chosen by both seasoned campers and hunters as well as inexperienced users. The unit is 19 inches long and is perfect for a range of uses including splitting, chipping, cutting hammering, and pounding. The head is constructed from Swedish stainless steel for longevity and features a sharp edge for easy cutting and chopping. The accessory comes with a wooden handle that provides a firm grip and feels smooth to touch. Carrying or using the unit is simple and easy courtesy of its lightweight of about 2.4 pounds. Consumers praise this wooden camping axe for its high quality, ergonomic design, durability, simple design, and compactness. A few, however, bash it for not being the sharpest and also say that the wooden handle requires regular cleaning and maintenance. The SOG Tomahawk F01TN-CP is among the most versatile and toughest hunting camping axes in 2019. It consists of a 2.75-inch blade made from tough and durable 420 stainless steel and a long glass-reinforced nylon handle. 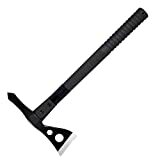 With an overall length of 15.75 inches and weight of 24 ounces, this axe feels pretty solid and is suitable for excavation, breaching operations, obstacle removal, and extraction among other uses. It’s more innovative than its earlier version and boasts of a tough and non-slip ballistic polymer handle. The carry sheath is also made from the same ballistic nylon while the black finish improves protection and elegance. Consumers love its decent weight, good size, sturdy blade and handle, and ergonomic design. The downside is that the axe is moderately small and doesn’t come with a full tang. The Estwing E24A holds the number one position on this review on the top 10 best hunting camping axes in 2019. Sportsman axe. It measures 14 inches long and comes with a tempered 3 1 / 4-inch cutting edge. Both the head and blade are made from stainless steel and come as a single unit. The fully polished axed not only looks elegant but is also easy to clean and features a heavy-duty ballistic nylon sheath for added protection and a non-slip leather grip. For enhanced beauty and elegance, the axe boasts a lacquered and sanded finish. Its key merits are high-quality finish, good weight, sturdy construction, firm grip, and simplicity. The negative is that it is meant for heavy-duty chopping, splitting, cutting, or kindling. Yes, it may look like a basic item, and this is probably why you spend little time choosing the right one. However, the value it will add to your hunting or camping experience is invaluable. It allows you to quickly chop wood, cut trees that may be on your trail, or even crush the bones from the animals you have caught. While finding an axe is easy, identifying the best isn’t. You have to look at issues like size, weight, material, portability, sturdiness, durability, user-friendliness and more. Fortunately, we have identified the top 10 best hunting camping axes in 2019. What remains is for you to click on the item that appeals to you most. And as always, don’t forget to a comment or opinion behind.